As fellow parents, we understand there is a lot that goes into keeping your children healthy. From their physical health to their mental health, we want to ensure our children are always living their happiest and healthiest lives. One thing we can often forget about, though, is our children’s oral health, which plays an integrative role in their overall health as well. 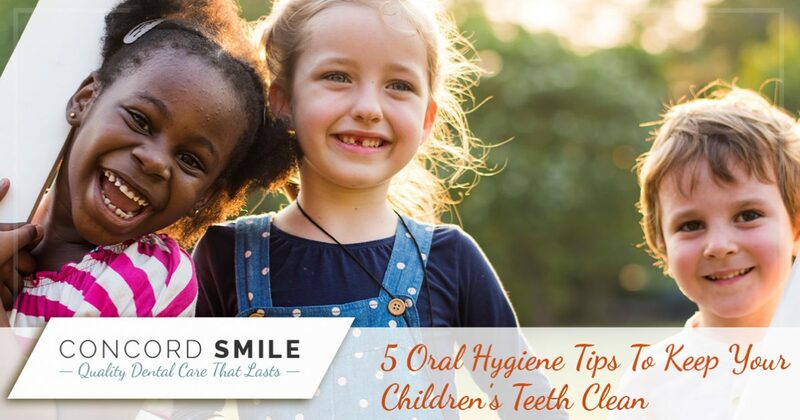 That’s why in today’s blog post, our experts at Concord Smile will go over five oral hygiene tips that’ll help keep your children’s teeth clean. If you’re looking for a reliable general dentist in the Concord community, choose Concord Smile for your next service. From deep cleaning services to general dentistry exams, we’re sure we offer the dental service you need to keep your personal oral health in mint condition. Contact us today to schedule an appointment. 1. Make it a habit for them to brush and floss their teeth twice a day. This might seem fairly obvious, but it’s perhaps the most important oral hygiene tip we have to offer. Ensure your child incorporates brushing and flossing their teeth twice a day into their daily schedule. 2. Remind them to regularly replace their toothbrush. This one is something we know most adults are guilty of — not replacing their toothbrushes when they should. It’s recommended that your child replace his or her toothbrush every three months to ensure they are always putting a clean toothbrush into their mouth. 3. Keep sticky, starchy and sugary foods out of their diets. When sugar gets stuck on your kids’ teeth, they serve as a food source for bacteria. From there, the sugar converts into acids, which can lead to tooth decay and cavities. Minimize the consumption of sticky, starch and sugary foods to keep your kid’s oral health in top-notch condition. 4. Try to minimize their consumption of fruit juice and soda. We all know these liquids are terrible for our teeth; therefore, we shouldn’t let our children consume sugary fruit juices and soda regularly. Your children are more vulnerable to cavities, tooth decay and discoloration if they regularly consume these drinks. The earlier you introduce your children to their dentist, the less likely they’re going to develop a fear of “the dentist’s office.” On top of that, your kids will start learning from their dentist, developing healthy habits earlier in their lives. Are you looking for a dentist to check on the condition of your oral health? Do you want additional tips and advice for properly educating your children about their oral health? Get help from our dentist at Concord Smile. Our office, located in Concord, is known for providing top-notch general dentistry services as well as excellent customer service. Our goal is to make you feel at home when you’re in our dentist’s chair. Simply give us a call to schedule an appointment for whatever general dentistry service you may require. You can reach our staff by calling (925) 557-1131 or by filling out our form online.